A sweet medley of summer fruit and sherbet make for a satisfyingly simple dish. Just use a melon baller to scoop the sherbet into small balls. Mix pie filling, strawberries, blueberries, cantaloupe, pineapple and banana in large bowl. 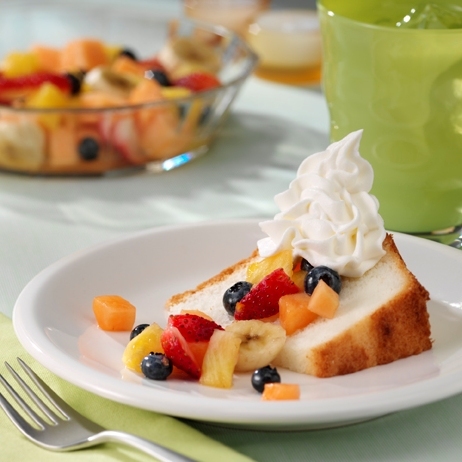 Place 1 cake slice on each of 12 dessert plates; top evenly with small scoops of the sherbet and the fruit mixture. Top each with a serving of Reddi-wip. Hmmm...looks so delicious. Great dessert. lami ang strawberries with whip cream pod...hehehe! musta na? Thanks ulit sis sa grasya, mwah.. Kung di sayo lagi akong itlog lol.. Mwah!